Pandemonium's World Tour of Percussion is our flagship concert performance and incorporates a huge setup covering music from around the world in a one hour gig. We start our show playing the roots of rhythm from Africa on large recycled telecommunication duct and then on to music from the Americas, Carribean, Europe and finally end on our huge scaffold structure covered in recycled junk playing the music of Stomp. Our instruments include West Indian steel pans, log drums, 5 octave concert marimba, vibraphone, Latin percussion, drum kit, bass guitar rig, junk rig and many other instruments. We also provide audience paticipation (for school performances) and quality informative compering regarding the music and culture surrounding the music. If applicable we can also perform this show with audiovisual support in the form of a projected datashow that incoprorates up to three live-action video feeds and special lighting. Please contact us to inquire about the World Tour of Percussion, and how we can adapt it to your needs. Junk Jam is our interactive show promoting the message of music making, making your own instruments and recycling. The audience at the show is given a recycled piece of 'junk' to play along with Pandemonium. Rhythms are taught to accompany us and be part of the band! This show is most suitable for younger audiences and can be presented by b etween two and six performers. Please contact us to discuss how Junk Jam​ could best be adapted to your requirements. 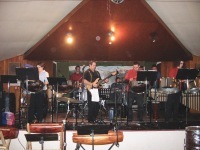 The musicians of Pandemonium often collaborate with other performers, including contemporary percussion ensemble repertoire such as ​Psyzygysm (John Psathas) and Ney Rosauro's Marimba Concerto. We have also collaborated with the Christchurch City Choir to perform the two piano and percussion version of Carl Orff's Carmina Burana. ​A current project is an upcoming performance of a work by New Zealand composer John Psathas, ​Cloud Folk , to be presented at the Re-Percussion 2018 concert. In 1892, Fred and Joshua Painter formed the Christchurch Professional Bicycle Band, one of the first of its type in the world. In 2009, Brett Painter (great grandson of Joshua Painter) from Pandemonium Charitable Trust set about re-forming this iconic Christchurch group. With support from the Christchurch City Council (CCC) Events Team, Welding Maintenance Co. and the Eureka Trust, and bicycle building from band leader Shane Price, the new bicycle band debuted at the 2010 Ellerslie International Flower Show and on the TV show What Now. The BeThere Bicycle Band performs music from the first half of the 1900s (Dixieland, war time music and marches) in replica costumes and on custom made replica bicycles. The current band size is 7 brass players, two percussionists and Shane Price, on his Penny Farthing. 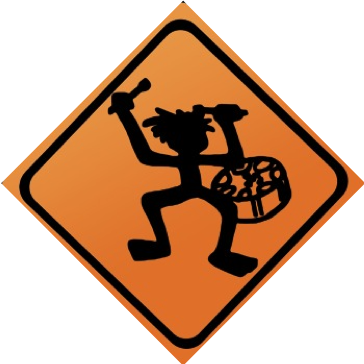 One of the main changes from the original band was to put the bass drum and snare drum players together on a tandem bicycle, rather than having a dedicated rider on the front of the tandem bicycle for the snare drum player. The combined physical and musical demands have proven to be quite a challenge for the percussion section! Please contact us for information about booking the BeThere Bicycle Band for your event. For people looking for a more conventional performance - we have a performance set that we perform with a professional Christchurch-based vocalist. This includes jazz, reggae, calypso, soca, as well as classical charts. We are the perfect group for a corporate function and for conferences; we guarantee that your guests won't have seen or heard a group like us before (unless they've already seen us!). Our rates are very competitive, and we can customise our music to suit your occasion. We are also proud to be able to work with 'Fireworks Professionals' pyrotechnics experts, who can add that extra spark to your conference show, indoor or outdoor. Fireworks and Calypso music is indeed an awesome mix. For more information please contact us. Pandemonium have developed a series of performances based on themes and ideas. In addition to the shows described below - ​Junk Jam, World Tour of Percussion, the BeThere Bicycle Band and a Vocal Show, we have also worked as a samba band and presented underwater concerts. We can mix and match elements of these to perform at your festival, school, corporate function, conference or other event. Please check out our demo video below and then contact us for more information or to discuss how we can tailor entertainment for your event. Hosting Christchurch's Re-Percussion all-percussion showcase concert every December. The annual concert features soloists and groups from primary, secondary, tertiary, community and professional organisations, and has been running for over 30 years. Performing at the Opening Ceremony of the ICC Cricket World Cup 2015, on the Caribbean As! stage (featuring a reunion band with Craig Given, Steve Fischer, and Jason Wilcox), and on the main stage (see TV footage on our front page). Garden Variety, a series of shows run by the Body Festival around the Rugby World Cup 2011 near the Christchurch Fanzone. Performing with Gareth Farr at the 2009 Air New Zealand Wine Awards. Presenting recitals of solo and ensemble percussion music, including 2009's Masters of Percussion in the company of John Psathas and Ney Rosauro. This concert featured solo and ensemble performances by Ney Rosauro and Pandemonium, including the premiere of Psathas' Stream 3.4 film and live performance. 2008's Pandemonium Proms, with the Christchurch Symphony Orchestra, Christchurch Town Hall, and as a guest performer at the CSO's Classical Sparks open-air concert, before an audience of 100,000+ people. Educational performances in Canterbury, Auckland, Wellington and Hamilton, including 2011's Africa Africa! (with guests Gert Kilian, Doug Brush, Ra McRostie and Emily Napolitano) and earlier World Tour of Percussion shows with Hollywood recording legend Emil Richards and Cuban percussionist Gilles Nantel. Performances as part of the Christchurch Arts Festival, New Zealand International Arts Festival, KidsFest, Alexandra Blossom Festival, and the Nelson Arts Festival. Corporate performances, including the NBR Arts Sponsorship Awards dinner (Auckland), the Champion Canterbury Awards dinner, and the Sport Canterbury Sports Awards. Junk Jam performances at numerous schools, libraries and community venues around Christchurch and the South Island, including recently at the Little Andromeda venue. TV performances on What Now, The Erin Simpson Show and the TVNZ National Anthem. 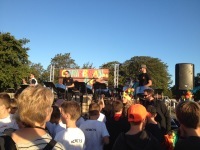 Parades in Christchurch, Timaru, Lyttelton and Alexandra with the ​CSM Samba Band.